I’ve had this lying around on my Kindle for ages — I received an ARC via Edelweiss — but I kept failing to get around to reading it. It’s been long enough now that I can’t remember why I initially requested it, and also that I remembered literally nothing about it when I began. I even convinced myself I was on the ball with posting the review because look! an August release, being posted in August! Until I realised that was August 2017… I’m not sure if I’ve had the book since then, but needless to say, it is no longer a new release. Sorry guys. I’m trying my best. I enjoyed the storyline of this book: at root it’s a fairly classic story of someone finding out they’re not who they thought they were, but made more complicated by issues of immigrant heritage and identity. 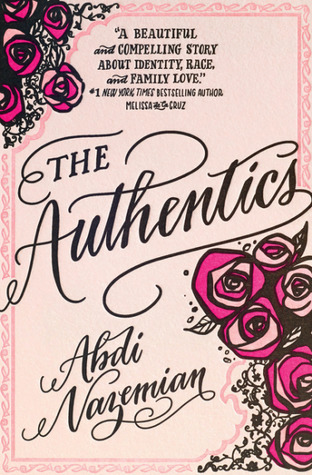 The main character has a group of friends who call themselves ‘the Authentics’ because they’re supposedly more ‘real’ than the fake people around them, but it turns out they’ve got plenty of their own secrets. This group would have been fascinating, because there were the beginnings of some interesting dynamics between them and they had hints of striking personalities… but I felt we never really saw that. Partly because we join the group when they’ve already been friends for years, and have had this ‘Authentics’ label for a while, so we never really saw how they meshed together and how that came about, but it meant I was never hugely invested in them. I also just didn’t really like the writing style, which made the overall book feel substantially weaker, and limited my investment in events. The pacing seemed off, with certain revelations being rushed or plonked down in front of the reader without enough build-up to make them really emotional, although you should bear in mind that I read most of this book on a plane and I hate flying, so I wasn’t on top form. I will say, though, that the main character was almost 100% believable as a teenage girl. My ARC didn’t have the author’s name prominently displayed until the very end of the book, so I assumed it was written by a woman. (I realise this was also probably because it was pink. WAY TO BUY INTO THE LIES AND STEREOTYPES, @ME.) But then came one moment when I began to suspect that the author was a man. Dude. My man. Friend. Women’s clothes do not come in ‘a medium’. They come in an arcane and mysterious combination of numbers that bears no resemblance whatsoever to the actual dimensions of the clothes. That’s just how it is. This teenage girl would not describe her size as a Medium, I promise you. The fact that this stuck out, though, shows that the character was fairly believable, so that’s a point in its favour. It didn’t feel like a very positive portrayal of teenage girls — there was a lot of girl hate, often over very shallow issues, and the ‘Authentics’ were pretty snobbish. Plus the main character kept complaining about how rich some of the other characters were, while seeming to live a lavish lifestyle involving Chanel handbags or whatever, so it was hard to feel very convinced by her. I would like to think ‘girly’ girls aren’t actually that shallow, and that the author was relying too much on stereotypes, but… honestly, that might be wishful thinking on my part, it’s hard to say. Mostly, though… I don’t know. I couldn’t really get into this book on an emotional level, and I think it was a writing-style issue, although I also felt that some of the more antagonistic character dynamics weren’t all that realistic. Perhaps it was because all the characters had history that we were told about, but we never really saw, so it lacked any emotional power on the page. I still cared about the plot, though, so I wouldn’t say it was unenjoyable. Just not a new favourite for me. *Seems to be hardback only, not sure if there’s a paperback or Kindle edition in the works or whether that’s all that’s available. I own one dress whose size is a number, but all of the rest of my clothes use the S/M/L system, so I dunno if this is regional or just a quirk of what clothes you happen to own, but a teenage girl describing her size as a “medium” wouldn’t have struck me as off at all.